Our philosophy is simple: we treat others as we hope to be treated. Invision combines state of the art eye care technology with an unwavering emphasis on the very best in patient care and service. 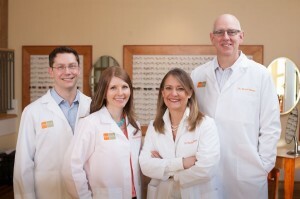 With our great selection of designer eyewear brands and a phenomenal staff that provides friendly and efficient care, we’ve been a mainstay of Christiansburg and Salem for years. Here at Invision, we don’t see our patients as just clients. We see them as our neighbors, our friends, and our family. Our hope is to know every patient by name, so you can feel as much a part of our community as we feel part of yours. We respect your time as well, striving to make all our processes better and more efficient without neglecting the personal side of patient-first care. Because we respect our patients as individuals, we want our frames to represent that as well. You’ll find frames in our optical boutique that aren’t offered elsewhere, because we never want our patients to sacrifice their style for optical needs. We’re dedicated to giving patients the highest level of care, so we are constantly working to find the newest and best technologies to bring to our offices. We strive to constantly seek advancements that will make your experience in our office more comfortable, our exams more accurate, and earlier detection more possible. We’ve been a trusted source of great eye care for years, because we’re committed to our philosophy of pushing diagnostic boundaries while staying grounded in our legacy of patient-focused care.